Home » Painting and Decorating Tips » 2015 » November » What Caulk? A decorator’s worst nightmare is to finish that paint job, only for the caulk to crack or craze leading to urgent repair or recompense. That’s why choosing the right filler is crucial for your decorating project. There are a variety of different caulks to choose from depending on your situation and project, from acrylic and vinyl caulks to siliconised acrylic caulk, silicone caulk, polyurethane foam, rubber sealants, and modified silicone polymers. Each has their own properties and usage, pros and cons. 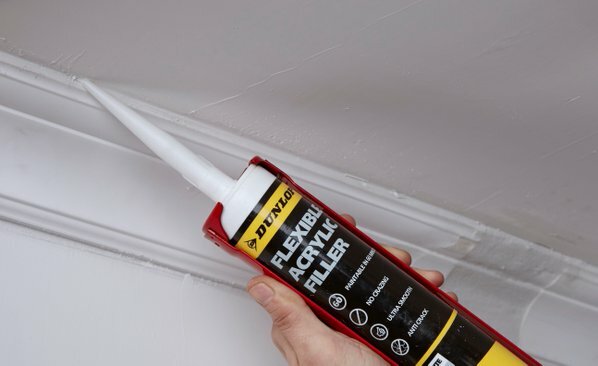 When working on internal or external applications which require overpainting, such as door frames, skirting boards, or ceiling lines, then an acrylic caulk – such as Dunlop’s new Flexible Acrylic Filler – is the best solution. Acrylic or vinyl caulks are the easiest to work with, providing a neat, clean seal and compatible with water-based and synthetic paints. However many decorators experience problems with caulk cracking or crazing when overpainted with emulsion, meaning it must be painted first with a primer or an undercoat – costing you both time and money. Unlike typical jointing products, the Dunlop Flexible Acrylic Filler can be overpainted with any oil or water-based paints without the need to spot prime and the painted surface will not craze or crack and remain smooth even after painting! Acrylic caulks are more flexible than vinyl caulks, adhering to most surfaces and remaining effective for more than 10 years. The Dunlop Flexible Acrylic Filler, an exciting new addition to the Pro Décor range, is highly flexible meaning that it does not crack or de-bond on drying – despite a rapid drying time of only 60 minutes depending on conditions. Such a fast drying time ensures the job can be finished in ultra-quick time, giving you more time to spend on other projects. While siliconized acrylic or silicon caulks offer water resistance, making them ideal for use around bathtubs and sinks, paint will not stick to most silicones, and they don’t adhere well to wood or masonry making them redundant for use in typical household situations which require overpainting. Unlike silicone fillers and some alternative acrylic caulks, the Flexible Acrylic Filler is extremely reliable, providing strong adhesion and flexibility meaning it will withstand limited movement once dry. In addition, while acrylic caulks like Dunlop’s Flexible Acrylic Filler can be easily cleaned up with water, silicon fillers must be cleaned with expensive solvents. Once you have chosen your caulk, then it is essential to apply it correctly. The Dunlop Flexible Acrylic Filler should be applied to clean and dry surfaces. Cut the seal off the top of the cartridge leaving the thread intact before screwing on the nozzle. It is recommended that the nozzle is cut at 45° to the required width. Caulk should be applied to the area required using a caulking gun, before smoothing the filler into the joint using a dry finger or silicone smoother to ensure a neat finish. Paint can then be applied -without the threat of cracking - as soon as the surface is dry, providing that superior finish. ← What Floor Paint to Use?